Last year was a tough one for Phil Hughes. Worse than that. “Last year was a disaster for me,” Hughes admitted to me before a August game with the A’s in Oakland. But this year has been much better. He’s top fifteen in strikeouts minus walks, a pretty solid (if simple) way to measure starting pitcher quality. A big part of the change has been mindset, according to the pitcher, but that mindset has benefitted from a few key changes. On the walks side of that equation, Hughes thinks it’s more about his approach than anything. “It’s not like I all of a sudden became a better strike thrower,” he laughed. He’s as comfortable as he’s been with his mechanics in a while, and he’s more likely to throw it in the zone — his strike zone percentage right now (59.9%) is higher than it’s ever been (54.1% career). 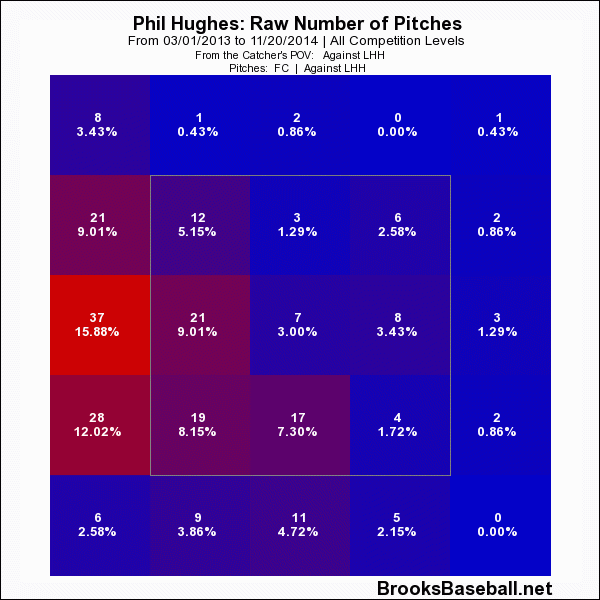 “I sort of told myself I’m going to attack the strike zone and throw strikes whether they are perfectly commanded pitches low and away or whether it’s on the plate a little more,” Hughes admitted. Part of that change in approach has come from the confidence afforded to him by his home park. Fly balls are a part of Hughes’ game (44.9% career, MLB average is 34.3% this year), and when it comes to Yankee Stadium and the AL East… “Fly balls don’t play well there,” as the pitcher put it. Going from a park that augmented homers by 10% to a park that suppressed them by 7% has helped him put up the best home run rate of his career, and has also helped him put up the best walk rate of his career. 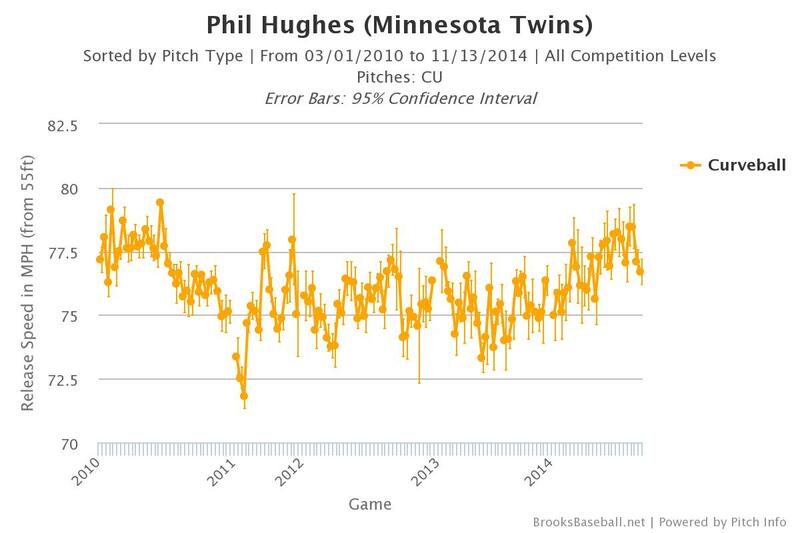 Minnesota is a much better fit for his four-seam fastball that has been the “one natural constant” for all of Hughes’ career. 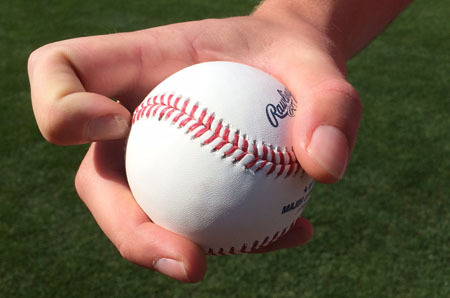 “With my natural arm stroke and wrist and hand action and everything, the four seamer tends to look like it’s going to come down due to gravity, but it kind of stays on the same plane,” Hughes said. Focusing on keeping his wrist stiff and behind the ball on the four-seamer gives him the rise or ride that he likes from the pitch. That rising fastball (he’s got just short of an inch less drop than most four-seamers) is good for whiffs (he’s got a 9.7% swinging strikes career on the four-seamer, and 6.4% is average) and for pop-ups (he’s got a career 5.4% pop-up rate and the league average is 3.3%). Listen to Sam Fuld talk about trying to hit a riseball, and you know it’s good for something. But it also means more home runs. “A fastball that stays on the same plane and is down is hittable, and when they do get hit, they have a tendency to go a bit further,” Hughes admitted. Even with his good year so far, he’s given up almost 30% more homers per nine innings than league average over his career. He’s worked on keeping the bases empty ahead of the eventual homer or two, but he’s also made advancements on the strikeout side. This year’s strikeout rate is the best he’s shown since becoming a starter, and he credits his work on his breaking ball mix. The slider is gone. 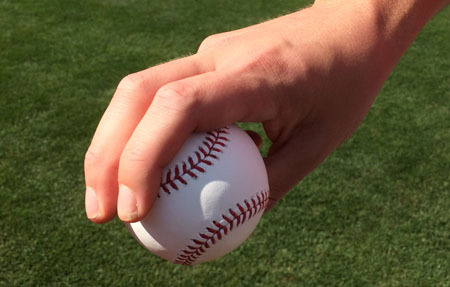 “I never had a great feel for my slider,” said Hughes. “I just threw it because I was going in a bad direction last year and I was trying to make something up on the fly.” Though he threw the pitch more than the rest of his offspeed pitches combined last year, Hughes never got an average whiff rate on it (13.4% last year, 14.4% is average). 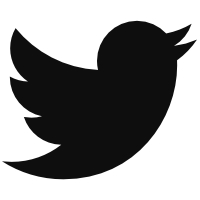 The slider that is no more. 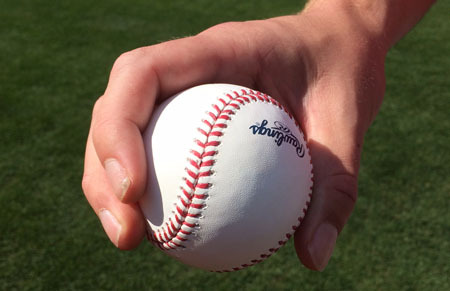 That cracked finger nail has bothered Hughes some on the curve in recent starts. “This year, I’ve gone back to throwing it harder and trying to get it to come out of my and along the same plane as my fastball,” Hughes said of his curve. You can see the difference in release points fairly easily. Check out 2013 on the left and 2014 on the right. Together with the added velocity, this new release angle could be a big part of the reason he’s now getting the best whiff rate of his career on that curve. The last piece of the puzzle was a change in his use of his cutter. “Before, when I threw a cutter, I mainly threw it to get back into counts, but this year it’s kind of almost been a pitch that I try get guys striking out looking on,” Hughes said. 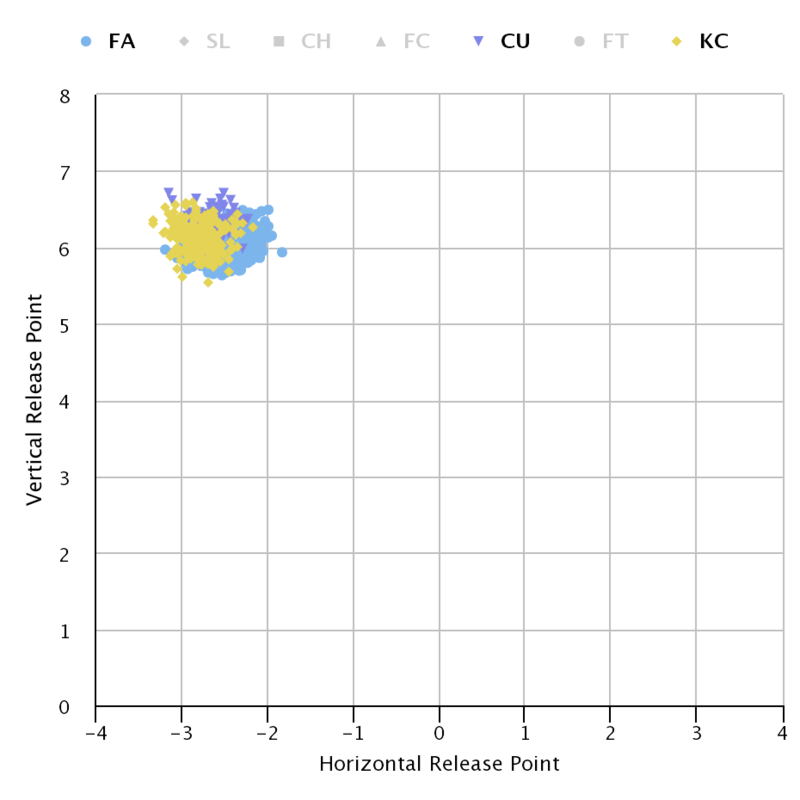 No classification system has Hughes throwing many cutters last year, but you can see that the pitcher is using his cutter more than three times as often with two strikes (39%) as he is with one strike (12%) this year. Hughes likes to go back door with the cutter. But there’s also deception at play with the cutter. “It comes out of my hand like a fastball, they think it’s a fastball off the plate and it comes back to the corners,” Hughes pointed out. 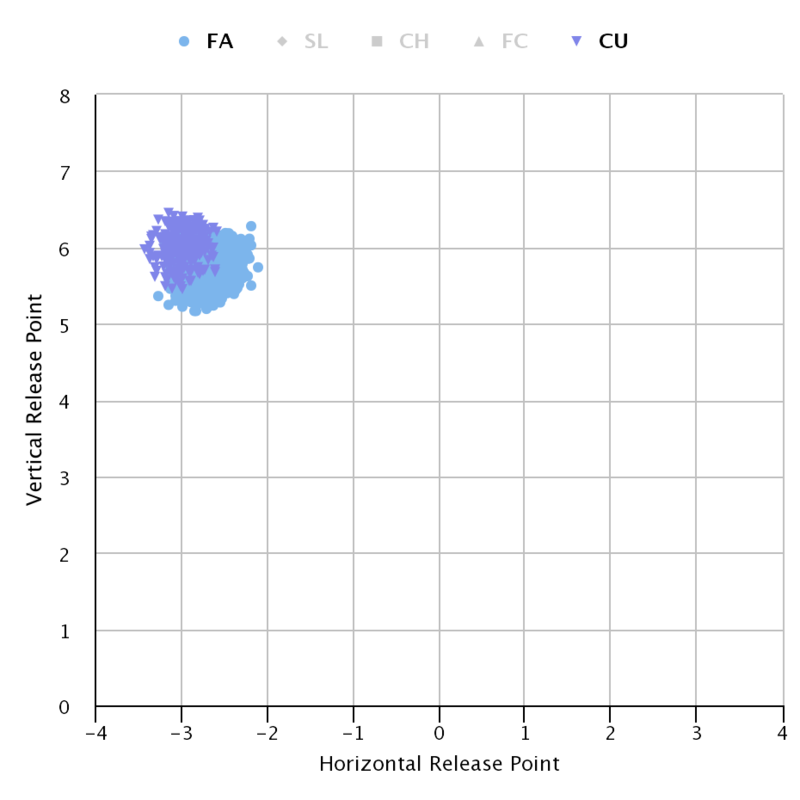 “It can nip a corner.” The cutter has a fastball-like velocity this year — 89 mph versus the 82 that his slider averaged — and is a ball about 8% less often, which makes up for the loss of swinging strikes (10% on the cutter). It’s obviously not just a mindset that’s allowing Hughes to shine this year. “I feel like my curveball is as good as it’s ever been, and when I can mix that in with a good riding fastball and my cutters that I’m trying to locate better instead of just trying to get back into a count, that’s been a good mix for me,” said Hughes, and you can hear all the changes he’s made in one place. We hoped you liked reading Phil Hughes Finally Found the Right Breaking Balls by Eno Sarris!